» 2010 relative percent cover of plant species in LTER moist acidic, dry heath, and moist non-acidic tundra experimental plots; and in new experimental plots established in 2006. 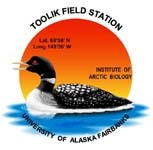 The LTER moist acidic tussock (Toolik MAT) site was set up in 1989. The experimental design is four blocks of 5 x 20 meter plots with randomly assigned treatments within each block. Treatments include control (CT), nitrogen (N), phosphorus (P) and nitrogen plus phosphorus (NP). Fertilizer is added annually following snowmelt in June as 10 g/m2 nitrogen (as NH4NO3) and 5 g/m2 phosphorous (as triple superphosphate). Exclosure plots were set up at the MAT site in July 1996 on extra 5 x 20 meter plots within the four-block design of the 1989 LTER acidic tussock experimental plots. On each plot a 5 x 10 meter section was fenced with large mesh (4-inch square mesh) and within this fence a 5x5-meter plot was fenced with a small mesh (1/2-inch square mesh). In each block two fenced plots were setup: a plot with no fertilizer and a plot with annual fertilization treatments as described above. Thus the treatments created are no fence, no fertilizer (NFCT); small mesh fence, no fertilizer (SFCT); large mesh fence, no fertilizer (LFCT); no fence, N plus P (NFNP); small mesh fence, N plus P (SFNP); and large mesh fence, N plus P (LFNP). Only NFCT, NFNP, SFCT, and SFNP were censused in 2004. The LTER dry heath (Toolik DH) site was also established in 1989 using the same methods at MAT in three block replicates. Exclosure plots were set up in 1996 using the same methods at MAT. In 1997 experimental plots were established at the LTER moist non-acidic tussock (Toolik MNT) site with the same methods as those used at MAT. CT, N, P and NP treatments are replicated in three blocks at MNT. The Sagavanirktok River (Sag) site was set up in 1984 and contains six vegetation types along a toposequence on the floodplain terrace. Vegetation types are moist tussock tundra, dry heath tundra, snowbed, equisetum/forb, wet sedge tundra, and riparian shrub. Each vegetation type had control (CT), nitrogen (N), phosphorus (P), and nitrogen plus phosphorus (NP) treatments. Fertilizers are added in the same way as the LTER tundra sites. Percent cover was recorded on tussock tundra and heath tundra types. Calculations: All percent cover values were summed within each plot, and then each value was divided by the total to generate a percent cover value standardized to 100%. Reference Citations: Gough, L. and S.E. Hobbie. 2003. Responses of moist non-acidic arctic tundra to altered environment: productivity, biomass, and species richness. Oikos 103:204-216. Gough, L., P.A. Wookey, and G.R. Shaver. 2002. Dry heath arctic tundra responses to long-term nutrient and light manipulation. Arctic, Antarctic, and Alpine Research. 34: 211-218. Shaver, G.R., J.A. Laundre, A.E. Giblin, and K.J. Nadelhoffer. 1996. Changes in live plant biomass, primary production and species composition along a riverside toposequence in Arctic Alaska, U.S.A. Arctic and Alpine Research. 28: 363-379. Permanent monitoring areas were established in all treatment plots in 1998. Eight 1 m2 plots are sampled in each treatment in each block each year at the end of July. A 1 m2 quadrat is aligned 0.2 m inside of the plot at the site of a flag marking the first measurement. Within this quadrat, aerial percent cover of all vascular plants are noted by species as is all other ground cover. Categories include moss (all species lumped), lichen (all species lumped), litter, and standing dead Betula nana. Bare ground, frost boil, and water are also recorded. As an indicator of vole activity, the percent cover of the plot comprised of vole burrow holes, vole trails, and vole litter (small pieces of dead plant material) are also recorded. To standardize cover among plots, all percent cover values were summed within each plot, and then each value was divided by the total to generate a percent cover value standardized to 100%. In 2006, a new set of experimental treatments were established in MAT near the earlier plots described above. These include a gradient of fertilization treatments that receive nitrate or ammonium alone, or receive N and P additions with 0.5, 1, 2, 5, or 10 g N added with half of that amount added as P. An additional set of plots were set aside upon establishment for future experiments, and are noted as H. We sampled from blocks 1-3 in 2008 from the following treatments: 06CT, 06F0.5, 06F1, 06F2, 06F5, 06F10, 06NO3, 06NH4, 06H. Gough, L. and S.E. Hobbie. 2003. Responses of moist non-acidic arctic tundra to altered environment: productivity, biomass, and species richness. Oikos 103:204-216. Definition: The year of percent cover measurement.